Nana: I couldn’t believe I was picked as #2. There are many beautiful people in Korea and for me to talk about being #2, I feel shy and embarrassed. Member who is the most sensitive? 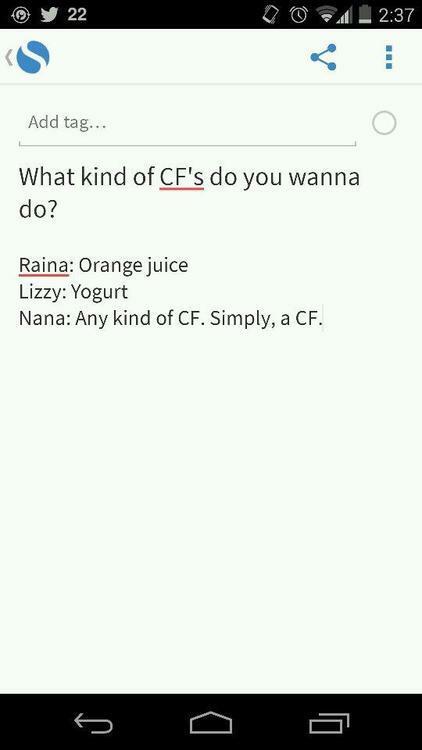 What kind of CF’s do you wanna do? Nana “It will only be us three (in OC). DJ : After School and Orange Caramel have a very different vibe. How was it during the activities? Which one is more fun? DJ : Which one fits your personality more? DJ : After School has more members..so in OC you have more parts? 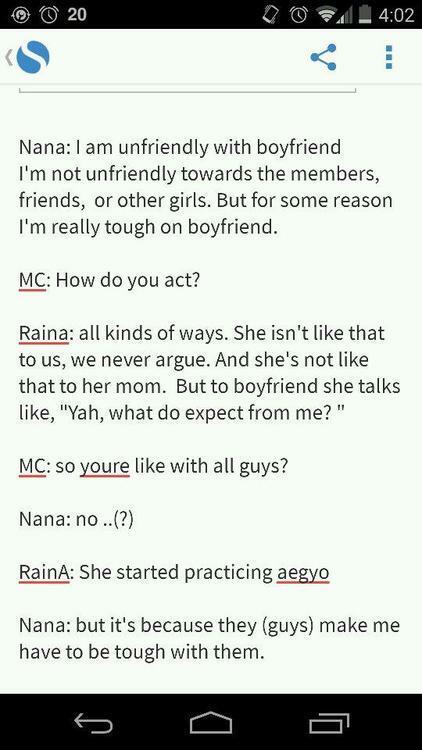 Raina : The “No, no,no” line (In bang) but in Orange Caramel, we divide evenly. DJ : I heard Nana was ranked #2 on ‘the most beautiful faces in the world’? DJ : What kind of rank is it? Nana : It’s a rank released yearly by TC Chandler. I ranked #2 out of 100 most beautiful faces in the world. DJ : Marion Cotillard was ranked #1..
Raina : I like her..she’s a france actress and she’s really charming..
DJ : Nana, did you feel sad that you didn’t get #1? DJ : Orange Caramel has a very unique concept. How was it when you start your activity as OC? Did you hesitate at first? 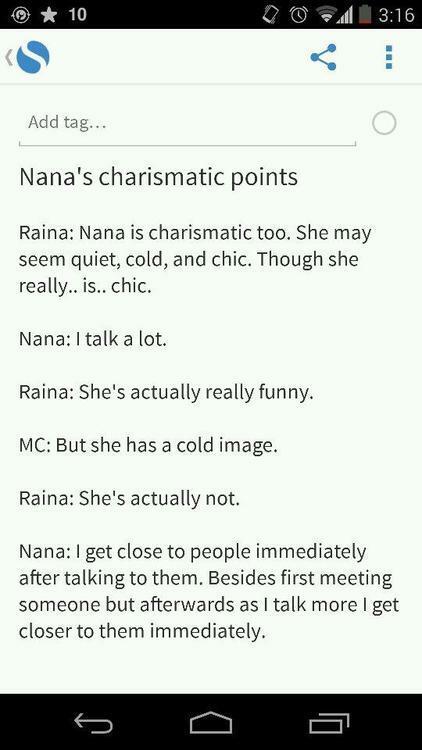 Nana : Actually, my personality is very different from OC cute and fresh concept. So I didn’t really like it at first. At first, Raina unni and I was kinda..
DJ : But I think you learn to like it now? DJ : Lizzy, I heard you retract your #1 target? DJ : But your manager can brought it for you. And didn’t fans prepare it for you, when you win #1? DJ : So, are all of you will eat sushi on stage? DJ : So only Lizzy who’ll eat sushi? DJ : Will you dip it in soy sauce? DJ : The best ‘hit song’ from OC? DJ : If OC hold a concert, who do you want to invite as a guest? Raina : Well, we’re only a unit and AS havent hold a concert in Korea, it’s hard for girlgroup. Well I hope we can hold it someday. PGZworld wrote: DJ : After School and Orange Caramel have a very different vibe. How was it during the activities? Which one is more fun? Honestly I am disappointed that Raina, Nana and Lizzy finds Orange Caramel more fun than After School because I am After School bias. But I'm not going to hold it against them and neither should Playgirlz/Playboyz. They are entitle to their preferences just like everyone else. I'm actually really happy that there are other fans out there that are disappointed like me because it means they like After School more than Orange Caramel like me. Even though fans are disappointed by Orange Caramel's preference I don't think fans are going to leave the fandom or hold anything against Orange Caramel. 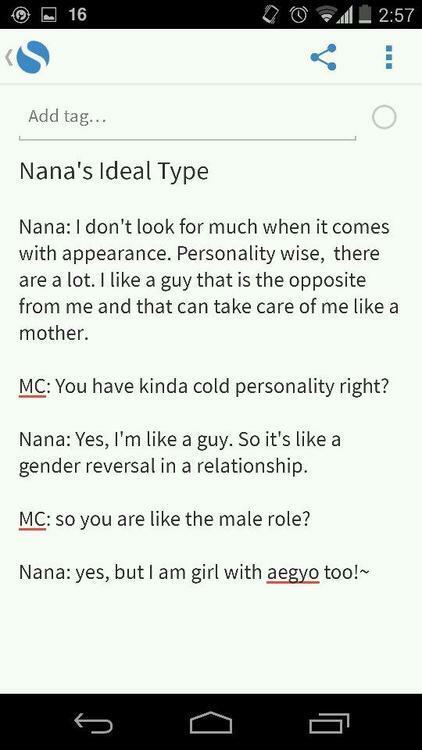 I'm actually more upset that I'm not Nana's type( I'm not the motherly type ). JayeLim920's opinion piece points out that Orange Caramel didn't explicitly say they like Orange Caramel more than After School. However "to like more", "to prefer more", "to enjoy more" and "more fun" are all synonymous. Also which group they are promoting as determines the activities, i.e. when they are promoting as After School they perform After School activities and when they are promoting as Orange Caramel they perform Orange Caramel activities. Since they think Orange Caramel activities are more fun it follows that they prefer being in Orange Caramel more than After School. If they had to choose one group only to be in i.e. After School or Orange Caramel I think they'll choose After School because they'll miss the other members so it wouldn't be more fun for them. If they choose Orange Caramel I'll feel very disappointed. As you can see the Flash Back teaser was Lizzy's idea and she had the sexiest Flash Back teaser photo. When the DJ asks which one fits your personality more? PGZworld translation had "Lizzy : Orange Caramel.." and JayeLim920 translation had "Lizzy and Raina : Orange Caramel" so which one is correct? Does anyone know when and where Raina says in an interview that if she got a second chance to choose the group she want to join she definitely will joining back After School? If I'm not mistaken, PGZWorld changed their translation after they've posted it because as some fans pointed out, their translations could be taken out of context and cause drama in the fandom (and it did, some people had a hissy fit over Twitter). So maybe that accounts for the inconsistency in the translation between the two. 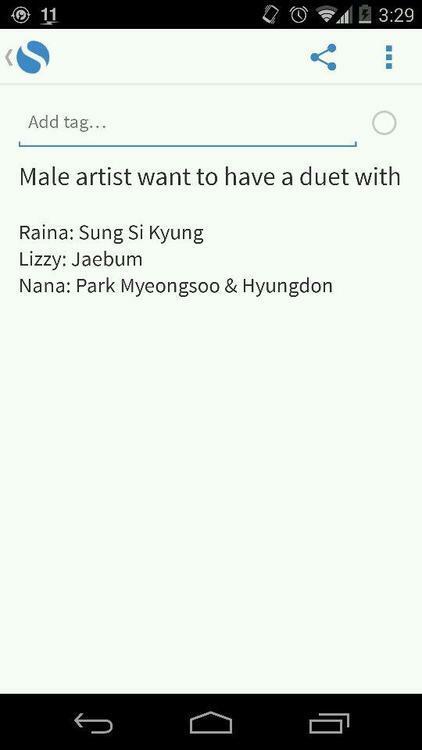 As for Raina's interview, I think I've read about it too but I've already forgotten. I understand why they prefer OC, because who doesn't want to have more lines and screen time during promotions? While their preference doesn't indicate they don't like being in AS anymore, I can see why some fans are disappointed. I think most of the resentment is because the other members (except Uee) aren't getting promoted in AS. But that fault lies in Pledis, and not because of OC themselves. AS is their flagship group, but it doesn't look like it with the way they're treated. I remember I was frustrated in 2010 when OC was created because AS was dormant for an entire year after Bang! promotions ended. But to be fair to Pledis, they gave equal promotions to AS and OC next year. AS promoted twice and released their first full-length album, and OC promoted twice as well. But in 2012, while both groups only promoted once, it was still upsetting because OC released their first full-length album and AS only got a mini. But then again, OC did not promote in Korea at all in 2013. Still, there's a lot to be found wanting in Pledis's promotions with AS. But fans should always remember that it's not like the members have a direct hand in their management (if that was the case, they definitely would've promoted more hehe) and they shouldn't direct their personal frustration with the way the members are being handled to the other members who are getting more promotions. albeitalways wrote: If I'm not mistaken, PGZWorld changed their translation after they've posted it because as some fans pointed out, their translations could be taken out of context and cause drama in the fandom (and it did, some people had a hissy fit over Twitter). So maybe that accounts for the inconsistency in the translation between the two. I think you've mistaken. I posted PGZWorld's translations in this thread before fans started having their hissy fits(well on ASDaze ask.fm anyway I'm not sure about twitter) so I'm pretty sure that the PGZWorld translations(regarding the part in question) has always been right. You could just ask PGZWorld whether they did or didn't change their translations or check their current translation and see if it is different from the ones I posted. albeitalways wrote: But that fault lies in Pledis, and not because of OC themselves. AS is their flagship group, but it doesn't look like it with the way they're treated. What's wrong with the way Pledis is treating After School?